In a paddy field, on a summer day a grasshopper was hopping and singing all throughout the day. The climate was very bright and he was very happy about that. When singing and dancing in the paddy field, the grasshopper saw an ant carrying some grains towards his home. "Hey friend, why are you working so hard? Come and dance with me", said the grasshopper. Without stopping, the ant replied, "I need to store some food for the rainy season, that is why I am taking this to my home". "Rainy season!!! thats very far away. Look, this is summer, you should be enjoying at this time" said the grasshopper. "Yes , but we will not be able to find food in the rain. I think, even you should be collecting some food for the rainy season", said the ant. But the grasshopper didn't bother to listen to what the ant said. He was singing, dancing and playing all the time, throughout that summer. The monsoon season arrived and it started to rain heavily. The grasshopper couldn't come out of his cave to get food. 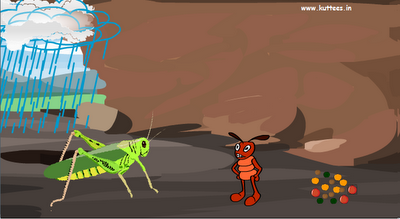 As the rain didn't stop for several days, the grasshopper started to starve without food. But his friend ant did not have any problem for food because he had already stored them during the summer season. 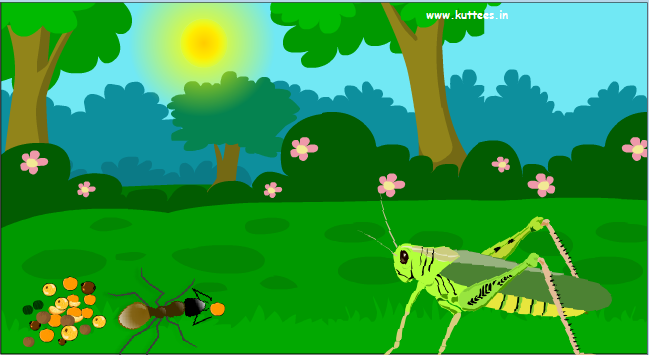 The grasshopper realized his mistake and apologized to the ant for not listening his words. Then the ant shared some of his food with the grasshopper. MORAL : Play while you play and Work while you work!